We’ve all heard the sales pitch about how Filipino virtual assistants can do anything, but I know some of us have been burned by Filipino virtual assistants who don’t meet expectations. “Filipino VAs are too much of a hassle.” “Any savings you get from outsourcing to a Filipino VA isn’t worth the convenience and quality of having your own staff or outsourcing to local business.” Have you heard any of that before? What most people don’t realize is that the right Filipino virtual assistant can take your business to a whole new level. The key to finding the right virtual assistant is to first have realistic expectations of what a Filipino virtual assistant can do. Then, from there, you’ll get a better idea of how much they are really worth. A virtual assistant is an individual who provides professional administrative, technical, creative, or social assistance to clients. They don’t fix broken businesses, and they can’t make your business for you. VAs are there to assist you in your business, and to help you run things more smoothly so you can have more time to do things that give you more value. We surveyed experienced Filipino virtual assistants all over the Philippines and asked them about their skills and what their employers and clients ask them to do. We got a list of these tasks and estimates of how long it takes them to do these tasks. What we saw is that almost all of these tasks are recurring jobs that businesses need, requiring at least long-term, part-time assistance. Most business owners might be wary of this because it means long-term, recurring costs. That is why we also did a cost-benefit analysis using Andrea Howson’s cost benefit analysis table to illustrate how much it would cost to hire Filipino assistants compared to hiring someone in house or outsourcing the same tasks locally on a full-time basis. 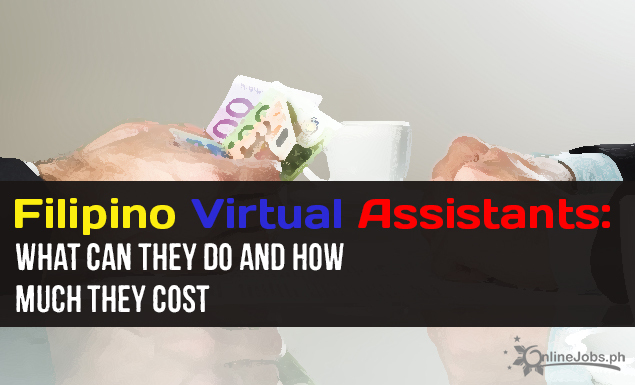 From there, we get a better idea of what Filipino virtual assistants can do, how much time it takes them to do it and, how much it costs to hire a Filipino worker to do these things. General VAs/ project managers, real estate, legal and medical VAs all fall under this category because they mainly provide administrative support. This category is common for a Filipino VA, and it is often seen as a starting point for virtual assistants who want to specialize in other fields. Below are the tasks most Filipino general VAs can do. The amount of time it takes to complete these tasks depends on the amount of work provided, but on average, most of these tasks can be completed in under an hour. For a general virtual assistant to do all these tasks for you on a regular basis would require from 20 hours to 40 hours a week. Programmers, web developers, and SEO specialists fall under this category. These virtual assistants typically cost more, but those who specialize in these tasks often have years of VA experience under their belts. They can usually handle more responsibility like general VA tasks, writing or design. You can’t have a website for your business without fresh content on a regular basis. To get regular content, hiring a full-time writer/designer is often the best option. Most Filipinos are proficient in written and spoken English, which makes writing tasks easier for them than their Asian counterparts. The presence of graphic design communities all over the country have increased the number of graphic designers in the Philippines these past few years. Social media is a great way for businesses to engage with their market. It can turn customers into advocates and can give small businesses a chance to reach a bigger market. Most social media tasks can be done by a general VA in less than an hour, and with social media tools, it can even be done even faster. Social media specialists are capable of setting up social media campaigns and tracking the progress of these campaigns through analytics to make sure that your business is being noticed. Can You Afford To Hire a Filipino VA? Below, we’ve put together how much it would cost to have all this done in a year, assuming that you would hire one person specialized in these different categories. Let’s say you would rather outsource locally to a VA that costs $20/hour and only hire that VA to work for 52 hours a year (or 4 hours a month). That would only cost you $1040/year. But how much work would that VA get done? What about tasks that require special skills like programming or SEO? 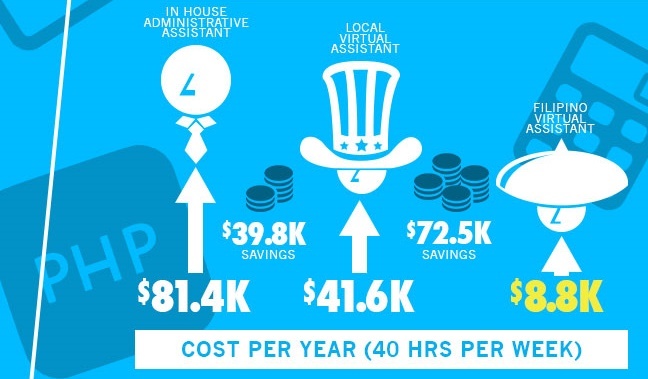 You would have to hire another freelancer at a higher hourly rate, which would make your costs go up.A lot of you may say that these figures seem exaggerated, but taking a close look at figures, you’ll see that the cost of hiring 5 Filipino virtual assistants full-time, with benefits, actually costs less than hiring one full-time, in house employee for a year. 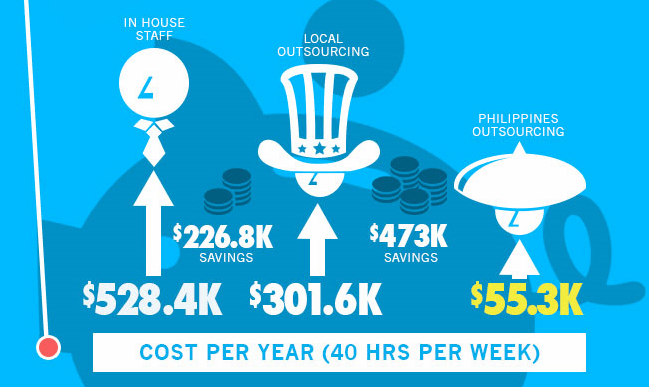 Hiring an entire team would only cost businesses $55,369.60, while a full-time, in-house employee would cost you at least $81,422.80. Think about it. You could hire 5 Filipino VAs with all of their skill-sets for less than what it would cost you to hire one full-time employee. If you had some of your VAs doing multiple tasks (a general VA to do social media, your SEO VA to also do writing), this would bring down your costs further. Even if you were to raise their hourly rates and give them more benefits, it would still be cheaper. Do you still think hiring a Filipino VA is not worth it? 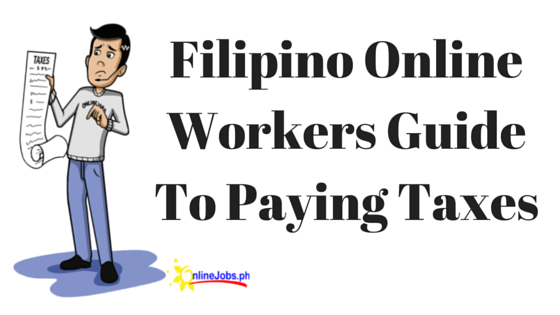 Is taking the time to hire, train, and manage a Filipino worker so much of a hassle that you would be willing to lose almost a hundred grand just to avoid outsourcing? In the end, the real question isn’t how much a Filipino VA would cost but rather, can you afford NOT to hire a Filipino VA for your business today? Also check our infographic below for a summary of the article. I’m Robert, I would like o inquire for a vacant postion as VA, currently I’m a freelance Graphic artist and I’m using Adobe Photosho and Adobe Illustrator. Bookkeepers can do all the VA’s task but not all VA’s can do bookkeeping…bookkeeping/accounting should be a separate category. A h/s graduate can be a good VA but can’t be a good bookkeeper/accountant. A non-accounting college graduate can be a VA but not an effective bookkeeper…oh come on how can they be a good bookkeeper at the same time? They don’t even know the meaning of double entry system and the terms debit and credit. Fantastic post, John. I think this post will live on for years around the internet. You spent a lot of time on this, and the graphics and information are great. I am currently employing one VA in the Philippines, but hoping to expand enough to hire several more staff soon. I’m glad things are working out for you. These rates are a disgrace. Filipinos are paid much more than that. Yes, there are those who accept these rates, but good luck with quality. 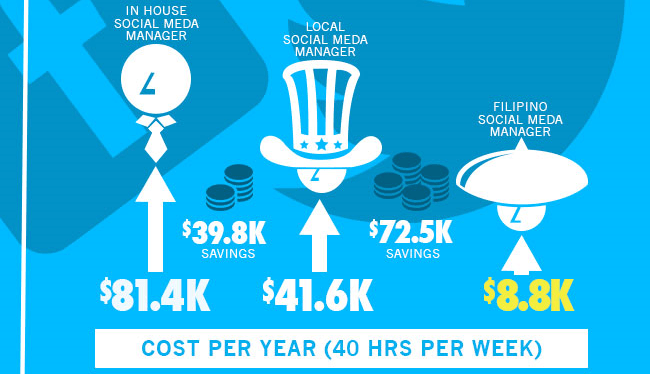 No self-respecting online worker / freelancer would work at these rates. Please adjust your pay information to market standards. Even if the Philippines is a third-world country, the real professionals here do not work for such low pay. We do our jobs well and we expect to get paid what is fair. Such rates are hardly just. Some employers/clients may say that Filipinos are not that good, but you only get what you pay for. Try our real professionals and pay at least even half of the “local worker’s” rate and see the difference. @Disgusted – We can disagree on this, but the reality is, if you look through OnlineJobs.ph at the rates people are asking for, you’ll actually find the rates we published here are higher than normal. We published that SEO people get $1100/month. Look through and see how many people are asking for $1100/month. We published that Writers get $850/month. Look through and see how many are asking for $850/month. I understand that pay is different in different regions, but we have 150,000 resumes. We have LOTS of data. We’ve also hired a lot of people. Skilled people. Talented people. The rates we published are for high end workers. @Agreed to John. If we do the math, those $2/hour are very realistic or even better than local employment in PH. It is true that skilled Filipino may demand a good deal but Filipino aren’t not that greedy in terms on online salary because we are talking DOLLARS here, if you do the conversion you will get 2x or 3x higher than salary rate compared to local employment opportunities. I will have to agree with @Disgusted. These rates are too low and timeframe for most of the tasks are incorrect. This information is misleading. @April – While I agree that these rates are too low for some (you may be one of them), the rates we’ve published are above average. 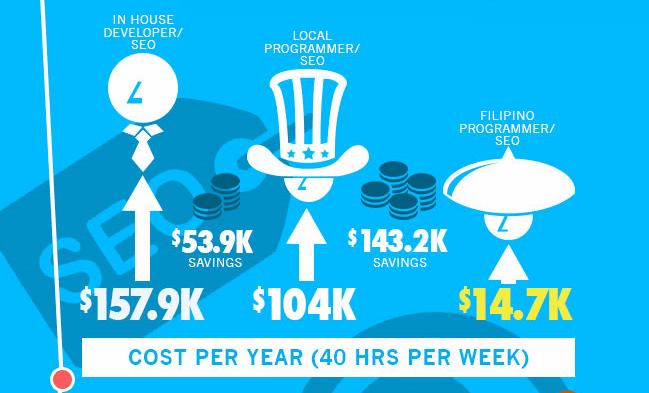 Spend a little time looking through onlinejobs.ph looking at the rates people are asking for. You may not like it, or agree with it, but they’re still the actual rates people are asking for. The rates are too low and it underestimates the value of Filipino skills. Employers from other countries might think that we, Filipinos, are cheap from your post. You haven’t even included other benefits that most local companies would pay for their employees like health and life insurance, insurance for the beneficiaries, meal allowances, incentives, bonuses, etc. A lot of Filipinos would just post low rates just to get hired even if they are being paid way too less than their skills but like what Disgusted said, you get what you paid for. So don’t wonder why they are not staying long in the company. Try to live in the Philippines and see if your $8k yearly income can even pay for your meals. We are Filipinos and we know better on how much we should be paid for. Please change your post, it doesn’t help the Filipinos. You can see that we strongly encourage employers to be generous to their Filipino workers in terms of salary and benefits. @Julia I understand that you wanted to entice clients but to the extent of making Filipinos look cheap is not a good thing. Please work on updating this post asap as it appears on the top of the search engine but the info are so misleading. Comments from other Filipinos in this post don’t also agree with you. I don’t find designing a logo in 1-3hrs reasonable. Those are probably copied/downloaded/cookie-cutter logos. It takes me at least a day to present a winning logo with little to no revisions. Means, I have to take into account what the brand is about. No wonder, I can’t find a Graphic/Logo Designer to add to my team that actually is a “designer”. This is unless the freelance designers are doing cookie cutter outputs because of the low payout.